On a vehicle’s back window. Puppies are just so cute. This one was at the vet’s for puppy shots. All dressed up and nowhere to go. This is Ruckus, our youngest dog. I wrapped the scarf I knitted around his neck for a photography assignment and had hubby bribe him with treats in hopes that he would sit still for a second for two. 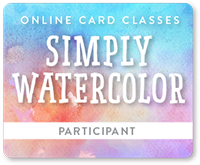 My second card while taking a course from Onlinecardclasses.com. My dog doesn’t look anything like the dog in the instructional video, but I can’t blame the instructor. I decided to experiment and make a few changes. I won’t be turning pro anytime soon, that’s for sure.